Discussion in 'Fan Art' started by AlittleMayhem, Apr 26, 2012. Originally drawn January 19th 2016, during the hiatus break. Description: Pencil Sketch. 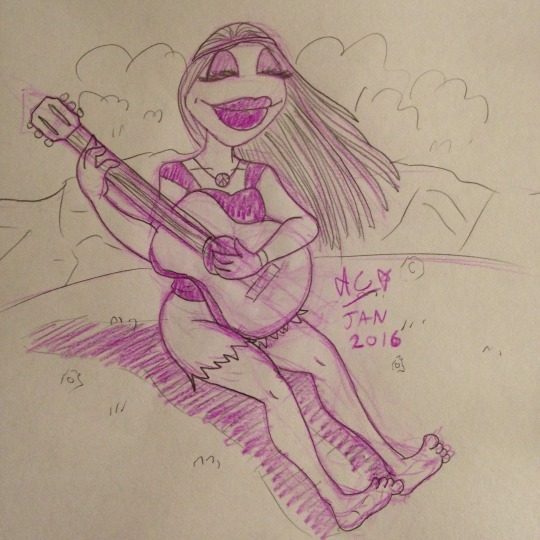 Janice sits in a peaceful grassy place playing an acoustic guitar as her hair blows in the wind. She is wearing a pink sleeveless top, a headband, ripped shorts and a peace symbol necklace. The ‘I don’t care’ shrug, followed by the ‘I don’t care’ resting hands behind my head! Description: Two images of Skeeter. Both have her wearing a green vest, blue shorts, purple trainers, a belt, green headband, star earrings and her usual green and white striped tights and long pink and black fingerless gloves. The first image has her sitting with her legs apart and shrugging her shoulders and looking very 'whatever'. The second image has her legs crossed, leaning back and resting her hands behind her head. The link above is of the Nostalgia Critic's Disney Afternoon video, to the part where he makes fun of the Quack Pack versions of Huey, Dewey and Louie. fufumuppet, Rock Steady, TheWeirdoGirl and 3 others like this. I just went through all of your artwork and I have to say that all of it is amazing! You bring such a great energy to the characters and I can't wait to see more of your work! Mary Bird, Janice+Floyd<3, AlittleMayhem and 1 other person like this. Made for Valentine's Day 2016! Description: As tiny red-and-white hearts surround them, Janice, in pink shorts and a purple vest top, dips Floyd as she kisses him (though the actual kiss is hidden from view as kisses are hard to draw). Floyd, wearing a red checked shirt and blue jeans, leans back and has his leg up, like a cheesy romance novel cover. Mary Bird, LipsGF4Life, Ruahnna and 1 other person like this. Another very over-indulgent fluff art of Janice and Floyd (It's the last one for a while, I promise) based on an image of Beyonce and Jay-Z from one of their films. Drawn March 25th 2016. Description: (It's a bit PDA, sorry) Janice sits on top of giant blue box (I think it's meant to be a dumpster from the image I took reference from), brushing her hair as she looks down on Floyd. Floyd is staning just beneath her as he cradles her right leg and kisses the thigh,just above the knee. Janice is wearing blue torn shorts, a pink vest-top, necklace, bracelets and Floyd's green Sargent hat. Floyd has a checked red and green shirt over a plain white one and Janice's hat. In the background is a plain caravan home (again, taken from the image I took reference from). Mary Bird, LipsGF4Life and SnakeLipsXD like this. Description: Janice relaxes and enjoys her time at one of favourite places in the world! The beach! She sits back on a blue and white blanket with a fizzy drink in one hand. She wears a wide brim white sunhat, a blue bikini bra and orange and white shorts with a pendant necklace ad some beaded bracelets. In the background is sand, sea and a perfect blue sky. This was drawn for a friend outside of MC who ships Rowlf/Piggy (and also Rowlf/Kermit and Rowlf/Kermit/Piggy but that's a different story). Also inspired by the 'Weak Ankles' scene from Disney's Hercules! Drawn May 12th 2016. Description: Miss Piggy, not seen by face in the image, thrusts her foot in front of a very flustered and surprised Rowlf. Piggy has a sparkly dark blue heel on her foot. Rowlf is red in the cheeks and breaking a small sweat. Mary Bird, charlietheowl and SnakeLipsXD like this. Silly comic also drawn from inspiration from same friend and based on a image from Vet's Hospital where it looks like Rowlf (as Dr. Bob) boops Nurse Janice with his nose. Think of this comic as a blooper for Vet's hospital. Drawn 18th May 2016. Description: Rowlf and Janice are in the middle of a Vet's Hospital sketch, dressed as Dr. Bob and Nurse Janice. Nurse Janice: Dr. Bob! What shall we do? TheWeirdoGirl, Mary Bird, LipsGF4Life and 3 others like this. Hmm, I wonder if this was before or after tried putting a cat next to the dead patient that is The Muppets 2015 TV series. AlittleMayhem and Janice+Floyd<3 like this. I love your art style! It's amazing!! Hey everyone! I realise that, once again, I haven't been on this site for a long time so here's just an update post. I'm currently on my 3rd year of my Fine Art BA Honours so I haven't really found the time to create art besides the stuff I need to do for college. It is also because of my degree that I've giving my social media a bit of a re-haul since we required to look at ways to promote ourselves on the internet as artists. That reason (and also because I have no interest in it anymore) is why I'm deleting my deviantart. It's still up at the time I made this post because I want to save some old art before it's gone forever. However, it will mean most past artwork including commissions and requests won't appear on this thread. So if you want to see my work, don't fret! I have an art tumblr and I will likely create a Google doc with my old art, including requests and commissions. 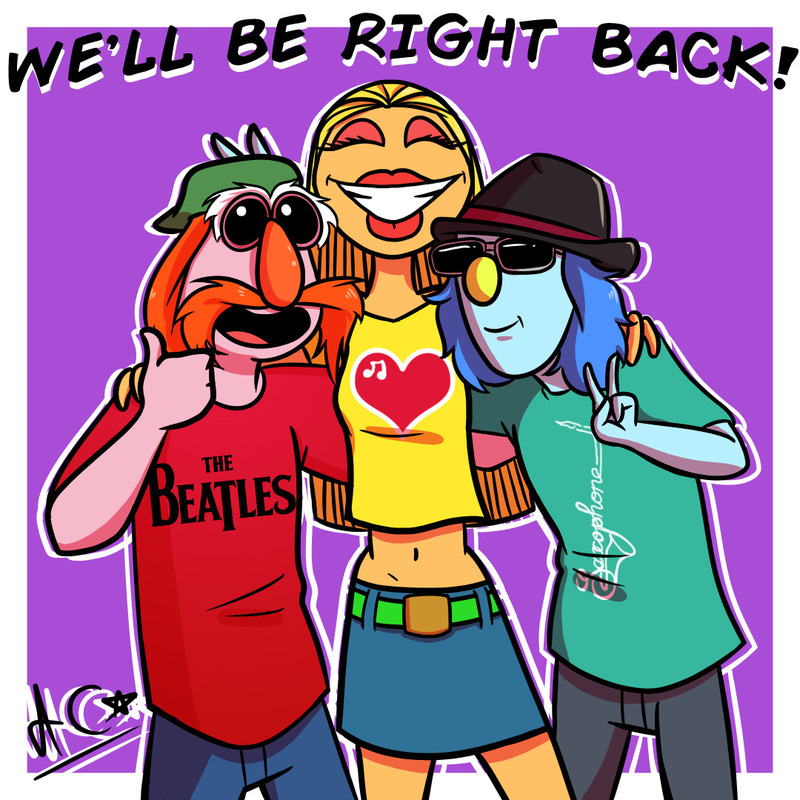 Also, I just realised that there are a few Muppet fanart I've made during my absence that's not here so I'll get to posting that soon (with descriptions, of course). newsmanfan, SnakeLipsXD, charlietheowl and 2 others like this. Shame that you are deleting your DeviantArt account. A little while ago, I heard there was a cancelled toyline for the Muppets called 'Muppet High'. It was supposed to be a follow up to Muppet Babies and would be a high school based franchise with the Muppets attending high school in the 1950s. Pretty cool idea, although I did'nt agree with some of the creative choices, such as Kermit being a Greaser and Animal being able to play the guitar (didn’t Dr. Teeth tell you that he either hits or eats and that’s it?). Anyway, that lead me and a few friends to create a Muppet High AU of our own, with lots of headcanons and art to go with it! You can see more of it here. To explain the art above, in our version Miss Piggy is the Greaser with her own gang of interesting members The Swine Divines (and this isn't even all of them). 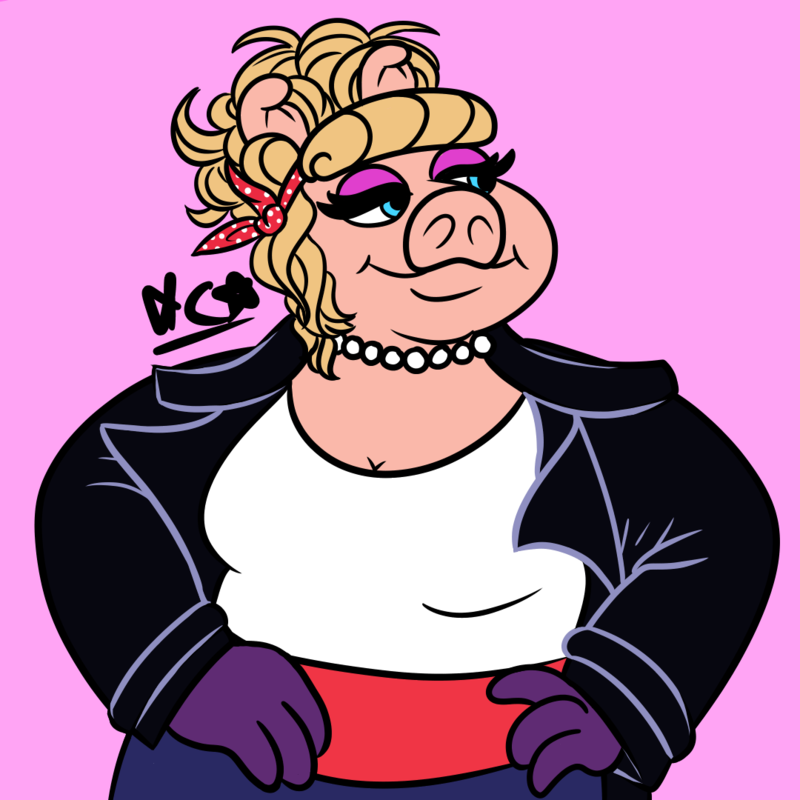 1st: Miss Piggy as a Greaser Girl and Leader of the Swine Divines. She’s smiling with her hands on her hips, oh so cool. Her hair is in a messy but stylish up-do with a red and white dotted hair band. She has her pearls around her neck, an open black leather jacket, a white shirt with red belt and blue trousers. 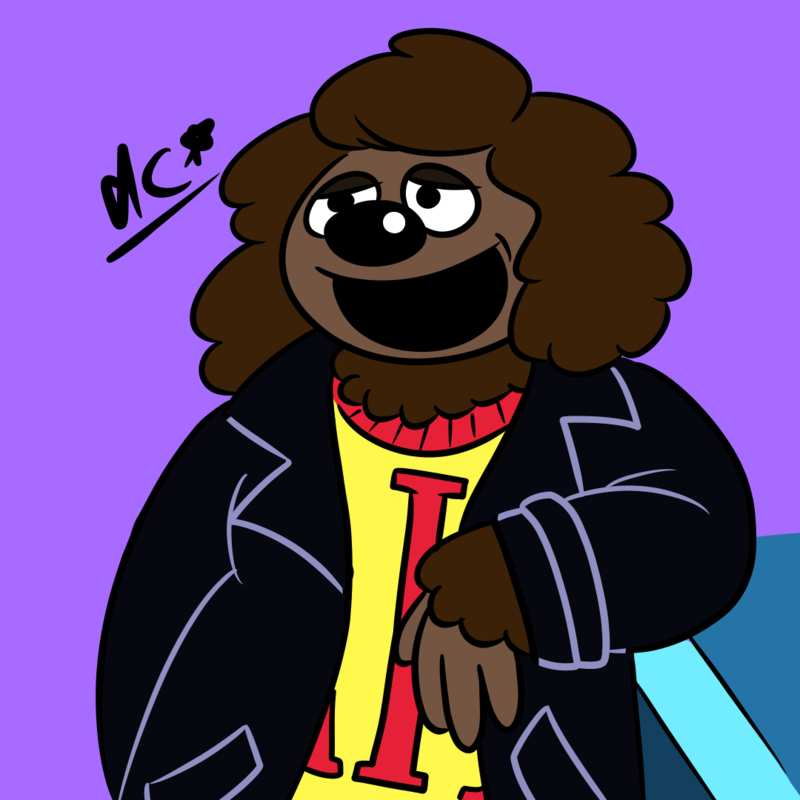 2nd: Rowlf as a popular football jock. He leans on a counter casually. His hair and ears are fluffed up, making him look younger. He also sports a leather jacket, along with the yellow school jumper, which has a red collar and red letters ‘MH’ on the front. 3rd: Janice as a bright and bubbly Cheerleader. Her hair is in a high pony-tail with a red headband with the front poofed up. 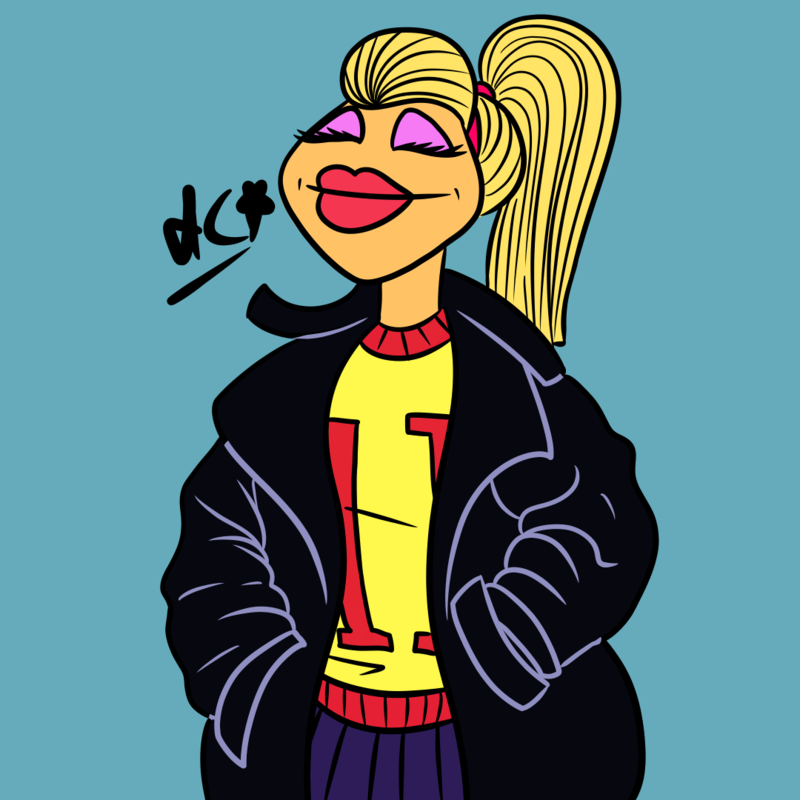 Her leather jacket is huge and over-sized for her, yet she wears it proudly over her cheerleader outfit, the school jumper and a blue plait skirt. 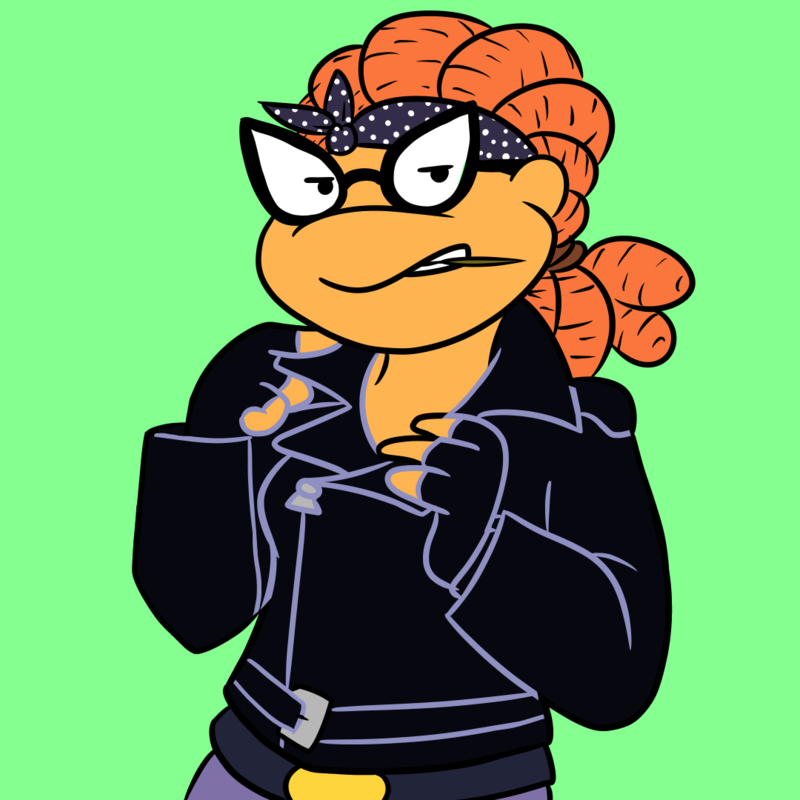 4th: Skeerter, the local delinquent and second in command in Piggy’s gang. She tweaks the collar of her jacket (a zipped up one with big collar and a belt) while peering to the side and chewing a tooth pick between her teeth. Her orange dreads and also raised up and in a ponytail, with a blue and white dotted headband around her forehead. Please do not repost anywhere without permission thank you. LipsGF4Life, SnakeLipsXD and MikaelaMuppet like this. So a while back, I made this artwork as a RenewTheMuppets art and, on the day it was announced that The Muppets was cancelled no less, I decided to finally colour it. Of course, I was more that upset at the news but I decided to recolour it slightly with a little bit of a positive look. And Hey! Since then, we've had an actual live concert from the Electric Mayhem AND a performance in Disneyland about American History! Description: Floyd, Janice and Zoot and grouped around each other and smiling, like they are taking a group photo. Floyd is on the left, giving a thumbs up with his arm behind Janice and Zoot. He is wearing a red Beatles t-shirt, blue jeans and a green cap. Janice is in the middle, standing the tallest and smiling the brightest with her arms around both guys. She is wearing a yellow shirt with a heart on it and a denim skirt. 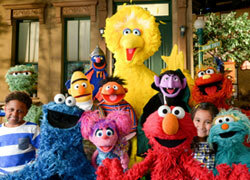 Zoot is on the right, giving a peace sign. He’s a little hunched because his other hand is reached out behind Floyd to give him bunny ears. He is wearing a turquoise shirt with the word, ‘Saxophone’ stylized to look like a Saxophone on it, his dark red trilby hat and skinny grey jeans. The words, ‘WE’LL BE RIGHT BACK!’ arches over them. Neat images mayhem. The one of the band, especially because of the message they have reminds me of the short Claymation "We'll be right back" inserts that used to air as part of ABC's Saturday morning animated offerings. Heh, another bit of proof backing Piggy casted as Betty Rizzo, leader of her own group of Pink Ladies. And with Skeeter as her second in command, they rule the school upon the start of the first day back to class. I'm intrigued on the rest of your Muppet High concepts, feel free to post 'em. AlittleMayhem, SnakeLipsXD and MikaelaMuppet like this. I have a few artworks and a fic of my own showcasing the Muppet High AU which eventually I will post here but I could post other headcanons in a separate thread? I mean, I'm not sure where I would put it seeing as it's not technically a fanfiction but what do you think? 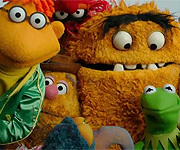 Well, I know there are threads for head-cannon theories like the Muppet Shipping or OTP (whatever that means) threads. Or you could post it as additional author's notes in the eventual fic thread, keeping it all in one place. BTW: Is that Muppet High fic posted at fanfiction.net? If so, under what title? By the way, OTP stands for One True Pairing. Thanks for the link, I'll go and read soon. I'm sorry (not for being absent, that just happens all the time now) for the art that for some reason isn't showing up properly here. I'll try to fix it but first, I want to post a couple of Muppet Arts I did recently. I'll also include descriptions (for Count of course) and links to the originals in case the images don't show here. Description: On a starry, moonlit night, Zoot and Janice sit on a bench and look into each others' eyes lovingly. They are sitting casually, with Janice crossing her legs and Zoot sitting kind of hunched over but his hand affectionately touches Janice's ankle. Zoot his wearing a dark blue suit,, orange shirt and red and black hat. Janice is wearing a short navy evening dress with a silver necklace and red platform shoes and her hair is tied in a braid. SnakeLipsXD and ConsummateVs like this.